Vibrant colors, flowing sandstone, and desert solitude! Antelope Canyon is a part of Navajo Nation in Arizona, and has been described as one of the most photogenic places on earth. Although it’s not nearly on the scale of the Grand Canyon, it's arguably just as beautiful and impressive in its own way. It's a slot canyon, with walls as high as 4,000 feet, notable for the beautiful “flowing” appearance of the Navajo Sandstone, an impression created by the running rainwater that floods it annually during monsoon season. Many slot canyons are too narrow for the light to really reveal the vibrant colors of the stone, but Antelope Canyon is a very fortunate exception to the rule. 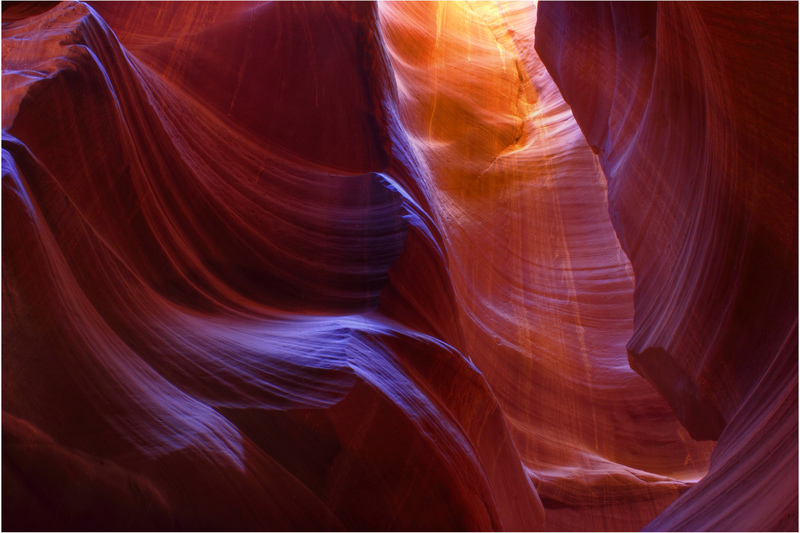 The shapes and colors of the canyon, as well as the light, can create some truly stunning photographs. Antelope once roamed freely there, eliciting its name. There are really two canyons, the Upper and the Lower. Upper Antelope Canyon is also known by its Navajo name, Tsé bighánílíní, meaning “the place where water runs through rocks.” It's such a photographer’s dream that photography tours are available for professionals and serious amateurs. There are camera requirements for the tour, so don’t think you can just show up with your iPhone. Guides will show you the best angles and how to capture the best light. The play of light, shadow, shape and color all come together here, so be sure to follow guide recommendations on the best time of day to visit. The stunning beams of light that shoot through the upper canyon in the summer months are one of the big draws for photographers and tourists alike. This “spiritual” experience, as it’s often described, is not always easy to capture on film, due to the light reflecting off the canyon walls, but you'll never forget it. The canyon is currently only accessible by tours authorized by the Navajo Nation, and time is limited to 2 hours. Tours include transportation by 4-wheeler to the canyon’s entrance. Note that in addition to the tour fee, you'll have to pay a permit fee at the entrance for permission to enter Navajo land. The Lower Antelope Canyon’s Navajo name is Hazdistazí, or “spiral rock arches.” It runs separately from the Upper Canyon, so be prepared to pay a separate tour fee. It’s another popular spot for photographers, but less so for tourists, probably due to the number of stairs required to access the canyon. If you're traveling in the winter months and the light beams are not a factor, many tourists recommend the Lower Canyon over the Upper. It’s just as beautiful and significantly less crowded. The views change constantly throughout the day as the sun moves across the sky, and there's really no bad time of day to visit. Only two tour companies are permitted to show the Lower Canyon, so make sure you book in advance. The canyons were created by frequent flash flooding, when rainwater from the basin above would flow down, picking up speed and sand as it went. Flash floods are still a danger that exists today. During monsoon season, the canyons may be closed without notice. In 2006 it was closed for five months due to flooding. Definitely call ahead to be sure they're open. Even if there's been very little rainfall that day, a flash flood could still occur. Guides will have swift water training and metal ladders have been bolted to the sides of the canyon walls for easy escape in case of emergency, so don’t let the idea of a flood deter you from this once-in-a-lifetime experience!